“Seven” is a lot of things. It’s a buddy-cop movie. It’s a thriller. It’s a murder mystery. It’s disgusting. It’s mind blowing. And though it might not look like a horror movie on paper, it is. Trust me. The movie follows two mis-matched detectives (Morgan Freeman and Brad Pitt) as they follow the gory trail of a meticulous serial killer who has been offing victims in ways inspired by the seven deadly sins. For example, the fat guy representing gluttony is force-fed until his stomach explodes. Would that really happen though? Who cares? It’s disgustingly awesome. Most movies like this can’t boast for the acting, but that’s another way “Seven” is unique. Freeman, Pitt and Kevin Spacey are phenomenal. Especially Spacey as the crazy, genius killer John Doe. “Seven” is actually a gimmick movie, but what respect it loses there, it makes up for in it’s fast pace and shock value. By 1995 moviegoers had seen it all. Desensytization had already set it. “Seven” managed to still shock people and that’s quite the accomplisment. Did You Know? 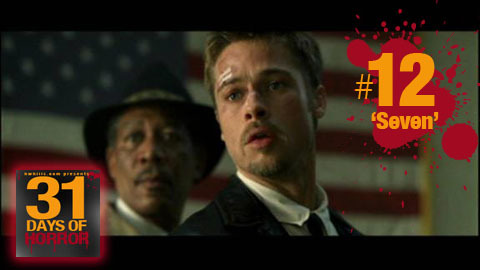 The F-word and its derivatives are said a discernible 74 times throughout the movie, mostly by Brad Pitt.